"No one answers the phone anymore." "Our emails aren't generating sales." Sound familiar? If so, it's time for you to explore Inbound Marketing for your company. 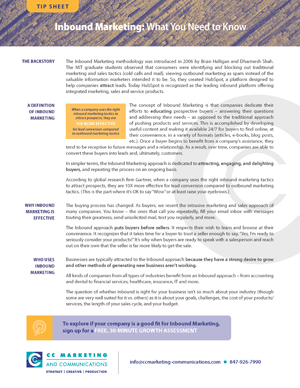 This tip sheet explains what Inbound Marketing is, why it's effective, and who is using it. Within a few minutes you'll have a solid understanding of why the Inbound methodology has enabled thousands of companies to transform their business and growth. It's the first step to exploring whether an Inbound Marketing program is right for you. Download Inbound Marketing: What You Need to Know today!